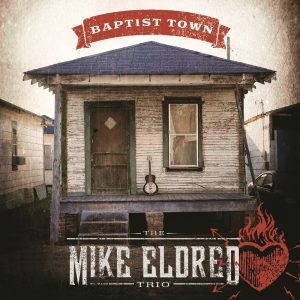 Released on May 6, 2016, Baptist Town, by the Mike Eldred Trio is a rare gem. Recorded at the legendary Sun Studios, the album features several guests adding their accents to a trio superbly skilled in their own right. The Mike Eldred Trio is Jerry Angel on drums and percussion, John Bazz on upright and electric bass, and Mike Eldred on guitar and vocals. From the first song on the album to the last, the listener is focused on the music, absorbing each note, eagerly awaiting the next. “Hundred Dollar Bill” is the first track off of Baptist Town. Spotlighting John “Big Nick” Samora on harmonica, the song perfectly captures the history of Sun Studios, with its high-octane rockabilly beat. This song will have Blue Suede shoes moving across the floor. “Papa Legba” exhibits a raw, gritty feel, with a heavy beat courtesy of Jerry Angel’s drum kit. Background vocals add to the song, giving it a dark and soulful gospel vibe. Staying with a gospel theme, “Somebody Been Runnin” features the Emmanuel Church Inspirational Choir, with Vicki Dove and Michael Buccowich lending their voices on background vocals. Clocking in at a mere 2:09, it is the shortest track on the album, but what it lacks in time, it makes up in content, and will have sinners wanting to repent their sins. “Run Devil Run” is unique, with tap dancer Lauren Brown lending her feet to this track. Listeners will be trying to keep up with her toe-tapping. The track also includes James Pennebaker on the mandolin, giving the song a country road feel. One of the slower songs on Baptist Town, “Roadside Shrine” is sweet and beautiful with a mixture of electric and steel guitar riffs showcased by John Mayer. Fans will connect to the message of this song every time they hear it. The title track is a soulful number with the smooth guitar playing of Robert Cray. Cray adds depth to a tune already lush with sound and emotion. The song opens with a muffled organ riff giving a Chicago blues theme, courtesy of Papa John DeFrancesco on the organ. “Can’t Buy Me Love” is the only cover on the album and is a phenomenal tribute to The Beatles original. A smash hit for The Beatles in March of 1964, “Can’t Buy Me Love” gets a complete blues makeover with heavy drum action by Jerry Angel. This slowed down version is an opportunity to get a groove on. “You’re Always There” closes out the album, again showcasing the Emmanuel Church Inspirational Choir. Baptist Town has something for every music lover, whether they dig Robert Cray, or the lap steel or electric guitar sound of John Mayer. The Emmanuel Church Inspirational Choir leads the album’s spirituality, leaving listeners in a good place. The album offers so much, both musically, and historically. We are adding Baptist Town to our collection; add it to yours soon.